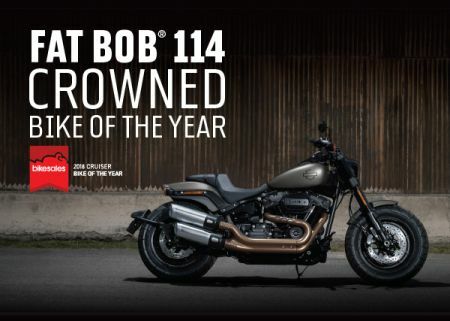 Let’s kick off the 2018 BOTY by announcing the Harley-Davidson Fat Bob 114 as our cruiser winner. Until the 2018 model year, the Fat Bob was a part of Harley-Davidson’s Dyna range. That all changed when the company completely revamped its Softail line-up for 2018, with three Dyna orphans – the Fat Bob, Street Bob and Low Rider – finding a new home. Bikesales rode all the new Softails in the sweeping hills above Los Angeles, with Harley-Davidson describing the Fat Bob as a bike that "encapsulates all that is great about the new platform" – which includes the updated Milwaukee-Eight engine (the Fat Bob comes with the 114 option), better suspension and lighter and stiffer steel tubular frames. It's not the lightest of the new brigade at 296kg, but the Fat Bob 114 (priced at $30,250 rideaway) is the agility and corner king. With the rider firmly wedged into place for some spirited action, there's plenty of lean angle and ground clearance, and the weight transfer through those footpegs is quite pronounced. In summary, it's a seriously competent machine – but one that's not just defined by its sporty nature. The Fat Bob is also an all-day machine that's comfortable as well, with a fabulous balance of style and performance. Judged purely on style, the 2018 Bike of the Year cruiser winner is a class act, from the faux carburetors (simply covers for the fuel injectors) to the spoked rims, the hardtail-look rear-end and the skinny Avon Cobra rubber. As our four-day BOTY road test in 2017 amply demonstrated, those yesteryear looks were backed up by some solid performance, with the 1200cc parallel twin punching out a broad wave of torque. The Bobber looks great, goes well, and at $18,000 (plus on-roads) it represents reasonable value for money, too. The Indian Scout Bobber ($18,995 rideaway) arrived at the perfect time. While the original Scout had provided a beautiful retro vibe since its inception, the question was often been asked: what about a factory custom too? Indian delivered with the Scout Bobber: a slammed, tear-away-the-chattels version of the Scout that in our books is now the company’s premier cruiser. There’s a lot to get enthused about. The 1133cc 60-degree V-twin is massively flexible and resourceful, perfectly content to perform its ‘cruiser-like’ low-end torque workhorse duties, but also happy to rev as well – all the way to the 9000rpm soft-action limiter. And it also looks great and has some beautiful finishing touches. The Rumbler 350 is playing in a class of one in Australia – and that distinction, the local arm of Royal Enfield hopes, will help it stand out in an increasingly crowded LAMS market. The engine is the essence of motorcycling simplicity and is perfectly at home filtering through a peak-hour crush and taking on a motorway. The suspension is thoroughly adequate and it soaks up typical potholes without fuss or fanfare – and because it's so agile it can be a bit of fun in the corners.